Starting this Friday, DD fans nationwide can now experience the pure deliciousness of Dunkin’ Donuts Glazed Donut Breakfast Sandwich. 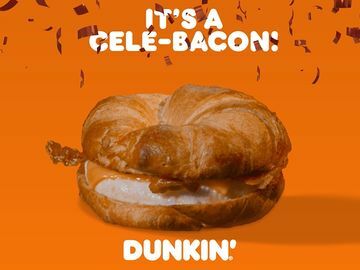 This savory and sweet breakfast treat, which consists of a fried egg and cherrywood-smoked bacon inside a split glazed yeast ring donut for 360 calories, will now be a permanent menu item at participating U.S. DD restaurants. 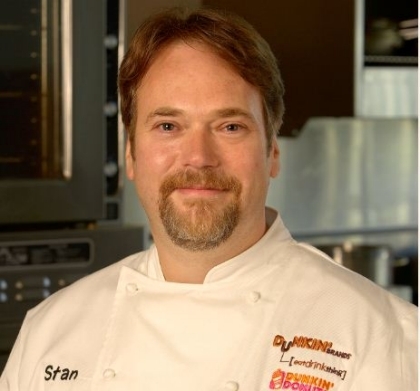 To keep us running this week in preparation to the launch on Friday, I sat down with Stan Frankenthaler, Executive Chef and Vice President of Global Product Innovation, to get the insiDDe scoop on the creation of the Dunkin’ Donuts Glazed Donut Breakfast Sandwich. 1.) What is the story behind the creation of the Glazed Donut Breakfast Sandwich? Our culinary team is always experimenting with both new and existing ingredients and flavors to come up with our creations, which many times are out-of-the-box ideas that lead to really innovative products. The Glazed Donut Breakfast Sandwich came about by combining some of our favorite Dunkin’ products from different sides of our business and taking it to the next level to experiment with savory and sweet flavors. It’s an incredibly unique sandwich that differentiates our brand and provides our guests with a great experience. The sandwich is fun and quirky and that’s what makes it very “Dunkin’”. 2.) How long did this product take to develop? 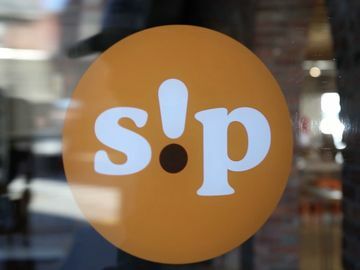 Based on all of the buzz and positive responses we received during testing, we knew we wanted to offer this nationwide and to be able to give it to our guests just in time for National Donut Day. The Glazed Donut Breakfast Sandwich was able to move fairly quickly because we are using ingredients that are currently on our menu. We had to train our crew members on constructing the sandwich – slicing the donut, adding the fried egg and bacon. 3.) 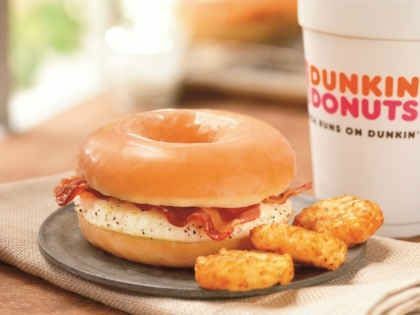 Tell us about the flavor and taste profile of the product in combining the glazed donut with what traditionally makes up a breakfast sandwich (egg/bacon)? The glazed donut is light and fluffy and gives you just the right amount of sweetness. Combined with the lightly salted, smoked bacon, the texture and flavors marry together in a wonderful way. It’s a delicious bite of the perfect harmonization of sweet and savory flavors. 4.) Do you see the culinary team further leveraging this savory/sweet combination moving forward? 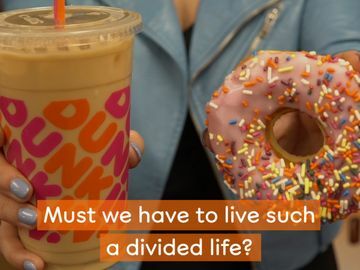 Dunkin’ Donuts is driven by our customers and their wants and needs. We’ve seen the savory and sweet combination becoming more and more popular. Our Waffle Breakfast Sandwich and Sausage Pancake Bites were great starting points for delivering these flavor profiles. We want to help guests discover their love of combining sweet and savory, and I think the Glazed Donut Breakfast Sandwich is a great way to do that. If this trend continues, we’d love to explore more options to offer additional menu items with these flavor combinations. 5.) What is the perfect beverage complement to the Glazed Donut Breakfast Sandwich? 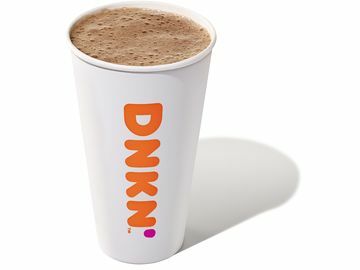 I think the perfect beverage to go with the Glazed Donut Breakfast Sandwich is a cup of Dunkin’ Donuts Original Blend Coffee. However you take your coffee, it will complement this sandwich. 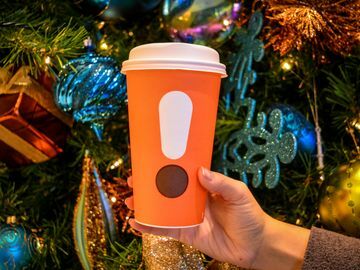 For me, I take mine with cream only. 6.) Is there anything else interesting or unique about the Glazed Donut Breakfast Sandwich that we need to know? We tried the sandwich with all of our meats, including bacon, ham and turkey, and besides bacon I think the next best meat to use in the sandwich is ham. It’s a little more filling, but the saltiness of the ham pairs really well with the sweetness of the glazed donut. Are you exciteDD for the Glazed Donut Breakfast Sandwich? Tell us on Facebook and Twitter!